Stretching!. Stretching for Working America 17" x 22"
Stretching for Working America 17" x 22"
17 x 22 in. Laminated Chart. Ten Minute Group Sequence from STRETCHING FOR WORKING AMERICA book. 17" x 22" 3-color laminated poster to be used as visual aid for display purposes. Consists of the Ten Minute Group Sequence from STRETCHING FOR WORKING AMERICA book. A stretching routine designed for factory or blue collar workers; a series of stretches to do while standing. Includes instructions for the individual stretches. The 17" x 22" poster includes instructions for the individual stretches; the smaller format (11" x 17") does not include the individual instructions. Posters cannot be shipped USPS Priority Flat Rate Envelope for $7.35; please choose only UPS or USPS Priority package shipping options (or USPS First Class Mail if ordering one paper Stretching for Working America poster). 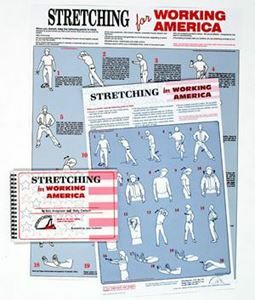 Also available: 11" x 17" poster, the STRETCHING FOR WORKING AMERICA book, and Stretching pads as handouts. Attractive, instructional 17" x 22" laminated 3-color poster. Perfect for display in the office! Handouts to office workers, clients of massage therapists, physical therapists, doctors. Stretching for Working America 11" x 17"
11 x 17 in. Laminated Chart. Ten Minute Group Sequence from STRETCHING FOR WORKING AMERICA book.